Taiko (太鼓) means "great" or "wide" "drum" in Japanese. Outside Japan, the word is often used to refer to any of the various Japanese drums (和太鼓, 'wa-daiko', "Japanese drum," in Japanese) and to the relatively recent art-form of ensemble taiko drumming (sometimes called "kumi-daiko," (組太鼓). 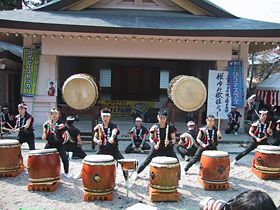 The taiko appears to have developed as a synthesis of indigenous traditions with Korean and Chinese influences introduced in Japan along with Buddhism during the Nara period (710 – 794 C.E.). The result is a wide range of percussion instruments that are used in both Japanese folk and classical musical traditions. Sacred drums were used in ancient times to drive away evil spirits, and to invoke rain for the crops. They were used in Shinto and Buddhist religious music, and during battle in feudal times to rouse the troops, intimidate the enemy and transmit orders. The body of a taiko drum is *made from wood, often from a single segment of a large tree trunk. Some are too large to be moved, and are permanently housed in temples and village shrines. Taiko has become particularly popular in recent years as the central instrument of large drum ensembles called kumi-daiko (組太鼓) whose repertory is based on folk and festival music of the past. A variation on a story in the Nihon Shoki (日本書紀), a Japanese chronicle completed in 720 C.E., relates that the ravages of the storm god Susanowo-no-Mikoto once upset his elder sister Amaterasu Omikami (the sun goddess) so much that she fled to a cave and, rolling a boulder over its entrance, vowed never to show herself again. The world fell an endless night. The 800 gods of heaven and earth gathered at the cave’s mouth and begged her to come out again, to no avail. Finally, the goddess Ame-no-Uzume jumped onto the head of an empty sake barrel and began a wild dance. The pounding of her feet made such a lively rhythm that the other gods began to dance and sing as well. Their merry-making became so raucous that Amaterasu peeped out to see what was happening, caught sight of her reflection in a mirror, and came out of the cave. The pounding rhythm of Ame-no-Uzume’s feet became the origin of taiko. Whether taiko emerged from indigenous Japanese traditions or was imported from Korea or China is uncertain; it most likely developed as a synthesis of indigenous folk culture with foreign influences. A clay figure of a drummer, unearthed in Gunma Prefecture and dating from the sixth and seventh centuries, indicates that its use was well-established by that time. The drum hangs at hip-level from the musician’s shoulder, and he is beating the drum with both a stick and the palm of his hand, as did Koreans drummers of that time. Scrolls and temple records documenting the use of taiko in religious ceremonies suggest that it may have been introduced along with Buddhism during the Nara period (710 – 794 C.E.). 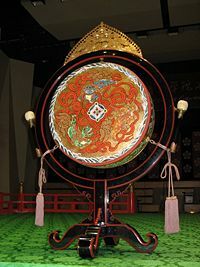 An ornately painted tsuri-daiko, used in gagaku music. Photo taken by Zhang Yuwen in Beijing, China, May 2007. Taiko were used in Gagaku (雅, 楽, "elegant music"), a type of Japanese court music based on saibara (Shintoist religious music and folk songs); komagaku, a Goguryeo and Manchurian form of court music; and togaku, Chinese court music from the Tang Dynasty. Komagaku and togaku arrived in Japan during the Nara period (710-794). Gagaku is one of the oldest styles of court music that is still being performed today. During the tenth century, Japan withdrew from contact with Korea and China, and many imported art forms evolved into a uniquely Japanese form. By the end of the Heian period (circa 1185 C.E. ), a style of drumming recognizable as taiko, had developed. Taiko are used in Noh and Kabuki plays, to create moods and settings and to mimic animal sounds, wind, the sea, and thunder. From ancient times, sacred drums were used to drive away evil spirits and pests that threatened the crops. It was believed that using drums to imitate the sound of thunder would force the spirit of rain into action. Drums were also used during festivities to celebrate a successful harvest..
Taiko were played by holy men in the religious music of Buddhism and Shintō, and by secular men in semi-religious festivals such as the bon dance. In some Buddhist traditions, the rumbling sound of the temple drum represented the voice of Buddha, and in Shinto shrines it accompanied prayers to heaven. It is said that in ancient Japan, the borders of a mura (village) could be marked by determining the farthest distance that the sound of a drum could travel from the village temple. In feudal Japan, taiko were often used during battle to motivate troops, to help set a marching pace, to call out orders or announcements, and to intimidate the enemy. Approaching or entering a battle, the taiko yaku (drummer) was responsible for setting the marching pace, usually with six paces per beat of the drum (beat-2-3-4-5-6, beat-2-3-4-5-6). According to one of the historical chronicles (the Gunji Yoshu), nine sets of five beats would summon an ally to battle, while nine sets of three beats, sped up three or four times was the call to advance and pursue an enemy. Daihachi Oguchi (1924 – 2008), originally known for his performances as a jazz drummer, is credited with forming the first modern taiko ensemble (kumi-daiko) in 1951, and reviving the ancient tradition of taiko in a new form accessible to the public. While playing the drum at one of the local shrines, he was inspired to add a jazz accent to the piece. He began to wonder why taiko had never been played as an ensemble before, and put together various taiko of different shapes, sizes, and pitches. The drums were arranged in the same manner as a jazz drum set. Since a taiko ensemble had never performed before and his musicians were amateurs, Oguchi based the rhythms on simplistic arrangement of the shrine music that they were accustomed to playing. This made it possible for almost anyone with an interest in taiko to join in. Oguchi’s energetic style made his group, Osuwa Daiko, popular throughout Japan, and the Hokuriku region became a center for taiko music. Oguchi formed, or helped to form, nearly 200 taiko groups in Japan, Singapore, Canada and the U.S..
Around the time that Oguchi’s taiko ensemble was becoming popular on radio and television in Japan, another group, Sukeroku Daiko, emerged. Their performances featured speed, fluidity, and power, and incorporated flashy choreography and solos. A member of this group, Seido Kobayashi, founded the group Oedo Sukeroku Daiko, considered to be the first professional taiko group. The exciting rhythms of taiko drum ensembles captured the imagination of percussion enthusiasts all over the world. In 1969, Tagayasu Den founded the taiko ensemble Za Ondekoza on Sado Island. Den set out to make taiko not just entertainment, but a way of life. He collected a group of youths from rural areas across Japan, who practiced a rigorous training regime that typically consisted of marathon running and communal living. After Den left the group, its remaining members, with the help of drums from Asano taiko, formed the Taiko ensemble Kodo, which has become one of the most popular and widely-recognized performance ensembles in the world. Since 1988, the group has also hosted the Earth Celebration International Music Festival, which brings music enthusiasts from all over the world to their headquarters. During the 1970s, the Japanese government allocated funds to preserve Japanese culture, and many community taiko groups were formed. Today, every school child in Japan is familiar with taiko, and many corporate events feature taiko drummers. 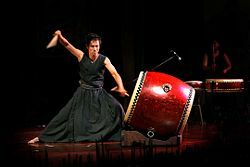 A more recent generation of taiko performers and groups includes artists such as Art Lee, a solo performer living in Japan, and director of a group, Tokara, through which he introduces a new style of artistry of movement and sound into taiko composition. Some groups, such as Wadaiko Yamato and TAO, are professional entertainers, while others like Shidara perform in local festivals and help to popularize the traditions of their region. The taiko band GOCOO from Tokyo is the first internationally renowned group lead by a female drummer (Kaoly Asano). GOCOO is also the first taiko ensemble to perform free-spirited taiko music, moving freely between the East and the West, tradition and pop, rite and party. The first American taiko group, San Francisco Taiko Dojo, was formed in 1968 by Seiichi Tanaka, a postwar immigrant who studied taiko in Japan and brought the styles and teachings to America. A year later, a few members of Senshin Buddhist Temple in Los Angeles formed Kinnara Taiko. In 1973, a group of young Japanese Americans in San Jose Japantown formed San Jose Taiko. In the 1990s, taiko groups began to appear on college campuses in the United States. The first intercollegiate taiko group, Kyodo Taiko, was formed by students at UCLA in 1990. In 1992, two more collegiate groups formed, Stanford Taiko at Stanford University and Jodaiko at the University of California, Irvine. It is estimated that about 36 collegiate taiko groups and about 300 taiko groups in general exist in the United States today. The taiko (太鼓) comes in various sizes and is used to play a variety of musical genres. Taiko drums are handmade in Japan by professional drum makers. It is believed that each drum embodies the spirit of the tree from which the wood came, as well as the spirit of the drum’s makers, and even of the performers who have played it over the years. Antique taiko are highly prized. Japanese taiko drums, while having antecedents in Chinese and Korean Janggu drums, have been developed into a wide range of percussion instruments that are used in both Japanese folk and classical musical traditions. Taiko, in general, are stick percussion instruments. With the exception of the kotsuzumi and ootsuzumi, all taiko are struck with wooden sticks called bachi. They have heads on both sides of the drum body, and a sealed resonating cavity. Taiko are also characterized by a high amount of tension on the drums heads, with a correspondingly high pitch relative to body size. This high tension likely developed in response to Japan's wet and humid summers when most festivals take place. Many taiko can not be tuned, and a high tension would counteract the loosening effects of humidity on the drum head. Taiko are categorized into two types of construction. Byou-uchi daiko (鋲撃ち太鼓) taiko have heads nailed to the body. Tsukushime-daiko (付締め太鼓) have heads sewn onto iron rings, which are then laced to each other around the drum body. Byou-uchi daiko are typically hollowed out of a single piece of wood. The preferred wood is keyaki (欅) due to its density and beautiful grain, but a number of other woods are used, grouped under the generic term meari (目有). Byou-uchi daiko cannot be tuned, and their sizes are limited by the diameter of the tree they are made from. The typical byou-uchi daiko is the nagado-daiko (長胴太鼓, long-body taiko), an elongated drum, roughly shaped like a wine barrel, that can be positioned in many different ways to alter the sound of the instrument. The drum can also be played by more than one performer at the same time. This style of drum also represents the family of drums that are made from a single piece of wood. Nakado-daiko are available in a variety of sizes, ranging in head diameter from 1.0 shaku (12 inches) to 3.0 shaku, in 1 sun increments. The chu-daiko is a medium sized nakado-daiko. Nagado-daiko over 3.0 shaku are also available, but they are referred to as ōdaiko (大太鼓, great drum). There are also smaller byou-uchi daiko such as the sumo-daiko and hayashi-daiko. The defining drum of any taiko ensemble is the ōdaiko (大太鼓, big taiko). The ōdaiko is the largest drum in taiko; some of the drums are so large that they cannot be moved and are kept permanently inside of a temple or shrine. Made from a single piece of wood, some ōdaiko come from trees that are hundreds of years old. Tsukeshime-daiko (付締め太鼓) are available in a wide variety of styles, and are tunable. This style of taiko is typically tensioned before each performance. The tensioning system is usually rope, but bolt systems and turnbuckles have been used as well. Tsukeshime-daiko can either have stitched heads placed on bodies carved from single piece of wood, such as the shime-daiko and tsuzumi, or stitched heads placed on a stave-construction body such as the okedo-daiko. The shime-daiko is roughly the size of a snare-drum, and is available in five sizes. Namizuke, or number 1 size, is the lightest and is used in classical theater such as Noh and Kabuki. Nichougakke, or number 2, is usually favored by amateur players for its light, yet sturdy, frame. Sanchou – gochou, numbers 3 to 5, are used by semi-professional and professional performance groups. Other Japanese taiko include the uchiwa-daiko (団扇太鼓、fan taiko), hira-daiko (平太鼓, flat taiko), and a host of percussion instruments used in Japan's traditional noh, gagaku, and kabuki ensembles. The Aomori region is famous for the Nebuta festival where huge okedo are played by many people while carted through the streets. The okedo has its own upright stand, invented by Asano Taiko Drum Company. Like the nagado-daiko, the okedo has a rim sound, called "ka." When playing the rim of an okedo, it is important to only hit the outermost metal ring, and not the actual rim of the drum body. The thin, light wood of the okedo is particularly susceptible to denting and will quickly deteriorate if hit. Bachi (桴|桴, 枹|枹, also batchi or buchi) is the name for the wooden sticks used to play Japanese taiko drums. Drum bachi are made in a wide variety of sizes and materials, appropriate for the drum they will be used to play. A typical bachi is about 22 mm (⅞ inches) in diameter, and 400 mm (16 inches) long, made out of a hardwood such as oak. This size is suitable for a wide variety of playing styles. 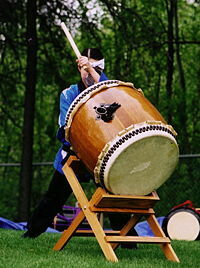 A bachi for playing a larger drum like the odaiko is bigger both in circumference and length. Smaller bachi are used for smaller drums. Some other woods commonly used to make bachi are: maple (kaede), pine (matsu), cypress (hinoki), magnolia (hou), beech (buna) and bamboo (take). Hou is one of the lightest and softest woods, most suitable for playing smaller drums with a sharp attack and less decay. On a larger drum, however, a hou bachi usually sounds "slappy" and flat, because it is too light to strike the thicker head of the drum with enough power to generate the lower tones of the drum. It is also too soft to play on the rim of the drum (in kuchi shoka, it is called a "ka") without denting the wood. Hinoki is slightly harder than hou, and is usually cheaper as well. On the opposite extreme, a kashi (oak) bachi is heavy and hard. It brings out a good sound when playing larger taikos, but on a smaller drum, it muffles the higher harmonics of the taiko, and sounds "thunky" and dead. Taiko drumming is a highly visual art form, so it is not surprising that bachi are sometimes decorated with bells and/or tassels for use during performance. Kuchi shōga (口唱歌), also known as kuchi showa and kuchi shoka, is a Japanese phonetic system for 'pronouncing' the sounds of drums, especially taiko. The system is used for recording, teaching, and memorization of drum rhythms. Although specific usage of kuchi shoga varies, certain words are relatively universal. For example, a deep, sustained sound from the center of the drum might be rendered as "don." "Do" sometimes represents a short beat that is not allowed to resonate, and "doko" often represents two beats in rapid succession. Two quick beats may also be pronounced "dogo" or "doro," depending on the rhythmic feeling, song or group. "Tsu" represents a lightly struck note, and a sharp tap on the side would be "ka." Two quick tsu's (soft right and soft left) or ka's (tap right and tap left) would be pronounced "tsuku" or "kara." Some taiko groups use "don," "do," "tsu," and "ka" to represent a hit with the right hand, and "kon," "ko," "ku," and "ra" to represent a left-hand hit. This allows the "sticking" of the song to be conveyed by the kuchi shōga. 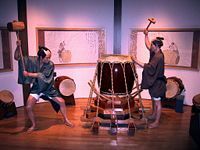 Kuchi shōga is also used for smaller drums; for example, the two sounds of the tsuzumi (also known as kotsuzumi) are "ta," a tap on the side of the drum, and "pon," a full-handed beat on the center of the drumhead. Rests or pauses are often sung using scripted sounds like "sa," "ho," "iya," or words like "sore" and "dokkoi" (a two beat rest). This is called "kakegoe." If the rest is not sung, the space is often filled with unscripted sounds called kiai's. Explicitly assigning words to represent the periods of silence in a song is likely linked to the Japanese concept of “Ma,” where the space between notes is as important as the notes themselves in a performance. A contemporary Taiko drummer from Taiwan. There are four different styles of taiko performance: one drum, one player (単式単打法); one drum, multi-player (単式複打法), where two or more drummers play one taiko; multi-drum, one player (複式単打法); and multi-drum, multi-player (複式複打法), where two or more drummers play a variety of taiko. Taiko drummers often choreograph their movements and add acrobatics and embellishments to make the performance more exciting. Taiko ensembles are made up almost entirely of percussion instruments, with a couple of exceptions. Each of the drums plays a very specific role in the overall ensemble. The most common drum in an ensemble is the nagado-daiko. Common string instruments used in taiko ensembles are the biwa, koto, and the shamisen. Of the woodwinds used, the most popular are the bamboo flutes known as the shakuhachi and the shinobue. Straight wooden sticks used to play taiko drums. Also called Jiuchi: A basic rhythm used to support the main rhythm, or the O-uchi. It can also be described as the meter or feel of a piece (being in a straight duple meter or having a swing feel). Some of the more common rhythms for ji are don doko, don ko, or don go (swing pattern). A Jikata is a performer who plays the ji rhythm. A Japanese term that can mean "interval" or "space" (i.e., 'a' tto iu ma; the space it takes to say 'a'; compare to the English saying "in the blink of an eye"). It is used in music to describe a period of silence. In taiko music, ma is the period between hits on the drum. It is important to appreciate this silence when playing taiko, just as you would appreciate the sound of a hit on the drum. Since ensemble taiko is focused on rhythm, the ma of a piece is critical to adding drama, excitement, and tension. Ma can be a rhythmic rest, or an extended silence, to be broken at the player's discretion. If the player concentrates on hearing the ma between each hit, in addition to the hits themselves, he or she will create a much more effective and satisfying sound. A good example of the use of ma is oroshi. Oroshi is characterized by a series of hits on the taiko. The player starts out slowly with plenty of ma (spacing). As the tempo increases, the ma between each hit becomes shorter and shorter, until the drummer is playing a rapid roll of hits. A high pitched instrument meant to establish a common tempo. It is held by hand. ↑ Shumei Taiko Ensemble Taiko: Myth and History Retrieved November 20, 2008. ↑ SFTD About Taiko San Francisco Taiko Dojo. Retrieved November 20, 2008. ↑ Taiko Kenne Thomas. Retrieved November 20, 2008. Hobsbawm, E. J., and T. O. Ranger. The Invention of Tradition. Cambridge [Cambridgeshire]; New York: Cambridge University Press, 1983. ISBN 0521246458. James, J. Alison. The Drums of Noto Hanto. DK Publishing, Inc, 1999. ISBN 0789425742. Malm, William. Traditional Japanese Music and Musical Instruments, revised, updated. Tokyo; New York: Kodansha International, 2001. ISBN 4770023952. McCargo, Duncan. Contemporary Japan. New York: Palgrave Macmillan, 2004. ISBN 0312227418. Morinaga, Maki Isaka. Secrecy in Japanese Arts: "Secret Transmission" as a Mode of Knowledge. 1st ed. New York: Palgrave Macmillan, 2005. ISBN 9781403981783. Shively, Donald H. Tradition and Modernization in Japanese Culture. Princeton, NJ: Princeton University Press,  1976. ISBN 0691030723. Tenko: Oguchi Daihachi No Nihon Taikoron [Heaven-Drums: Oguchi Daihachi’s Theory of Japanese Drums]. Nagano, Japan: Ginga Shobo, 1987. This page was last modified on 11 November 2015, at 16:35.